Dining set comprising of 6 x armchairs and 1 x circular table. By looking up to the sun, you will find the true inspiration for the creation of the O-ZON range. 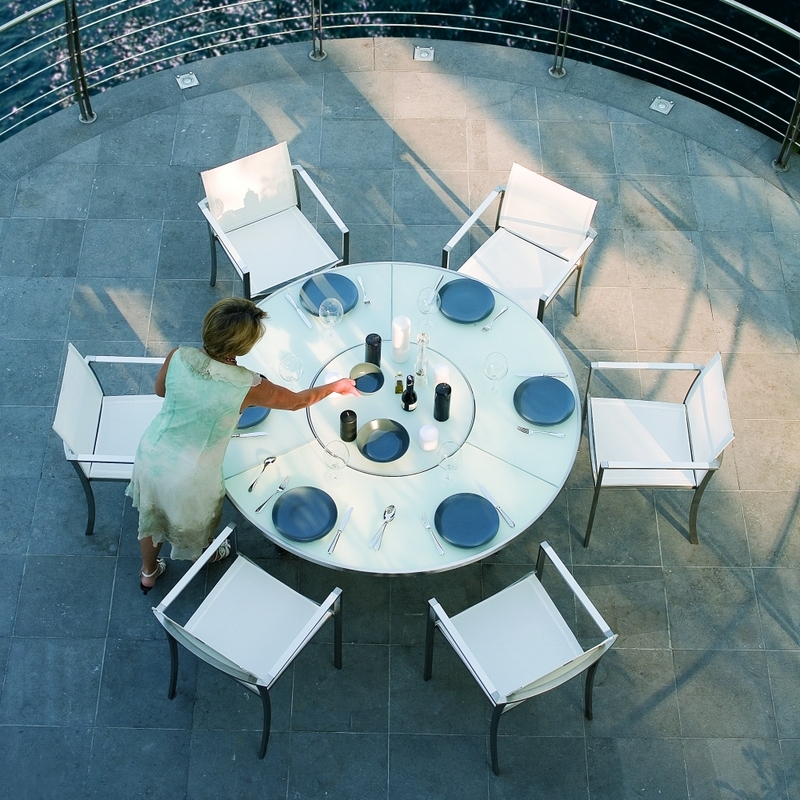 This outdoor furniture range was created by Kris Van Puyelde, the co founder of Royal Botania. At the heart of this collection is a round table measuring160cm that seats 6-8 people, with a space at the centre for an umbrella. To enhance the qualities of the table, a Lazy Susan (large rotating plate) is situated in the centre, which makes it easy to share food and drinks amongst friends and family seated around the table. The frame of the table is made from stainless steel with a top in glass. The glass is available in white, cappuccino and black. The stackable chairs from the O-ZON collection are also stainless steel frames, upholstered in Batyline and are available in co-ordinating white, cappuccino and black. The armrest colours are matched to finish of the table top using Batyline to give a truly co-ordinated stylish look. Royal Botania use new technology processes to create the glass table tops. Previously the glass surface was sandblasted, which made the table hard to maintain. Now the glass has a coat of colour (aluminium silicate) applied through a screen-printing process, and then fired at 400ºC. Due to the enormous success of the O-ZON range, each year new pieces are added to enhance its appeal. Now there are 4 tables ranging from 90cm - 185cm in diameter. 2010 sees the launch of the new bar high tables. The tables can be converted with handy leg extensions to make a high reception table with elegant bar chairs. A new reclining lounge bed has also been introduced into the collection (OZN195). The curved lines of the lounge bed invite individuals to stop, slumber and relax. The backrest has a 6 point adjustable setting, allowing for optimum comfort for anybody. The stainless steel frame is fitted with Batyline fabric, available in 5 standard colours: white, cappuccino, black, orange and turquoise. Please contact us for pricing of anything from this range.